Give your pipes a helping hand this winter season. If your pipes run through a cabinet or vanity open the doors to give your pipes some warmth from the warm temperature of the room. If there is no doors to open, just leave the water trickle from the faucet. The cost of the water running is a LOT lower then the cost of a frozen pipe being repaired. If you would forget to leave the water trickle or a door open, here is what you can do to thaw the pipe. Turn off the main shut-off valve. Use warm air from a hair dryer or space heater to melt the water frozen inside the pipe. NEVER leave the space heater unattended. After the pipe is thawed slowly turn the main shut-off back on. When the water is running throw the pipe check for any cracks or leaks which could of been caused by the freezing. If you have a burst pipe, shut off your water and give us a call! We are here to help! We remediated a home located in the Mount Gretna/Lebanon area. Mold growth started in the basement and the spores spread throughout the home. Quality air tests, dry ice blasting and cleaning put this home back into a safe environment. Mold can spread through a home in as little as 48 hours! Water damage may be fairly simple to spot, especially if you are a hands-on homeowner who fixes and repairs things as they crop up. The problem is that water damage to foundations is not an easy water damaging problem to identify. Nevertheless, the key to minimizing the extent of the damage is always to spot it quickly and address it as soon as possible. How are you supposed to achieve this if you don’t know that there is water damage in the first place? This guide, provided by SERVPRO of Western Lancaster County, to some of the most common symptoms of water damage within foundations will help you spot any problem areas. If you are routinely dealing with standing water in the basement, you are probably getting a little stressed out. As a consolation, however, it does mean that you can be reasonably sure of a foundation problem. Standing water only accumulates and sits in a basement if drainage systems are not functioning properly. If you speculate that there could be an issue with moisture, take a look at the soil around the foundations of the property. If it is unusually wet (even after days without rain), there is a good chance that groundwater is seeping into the foundation. 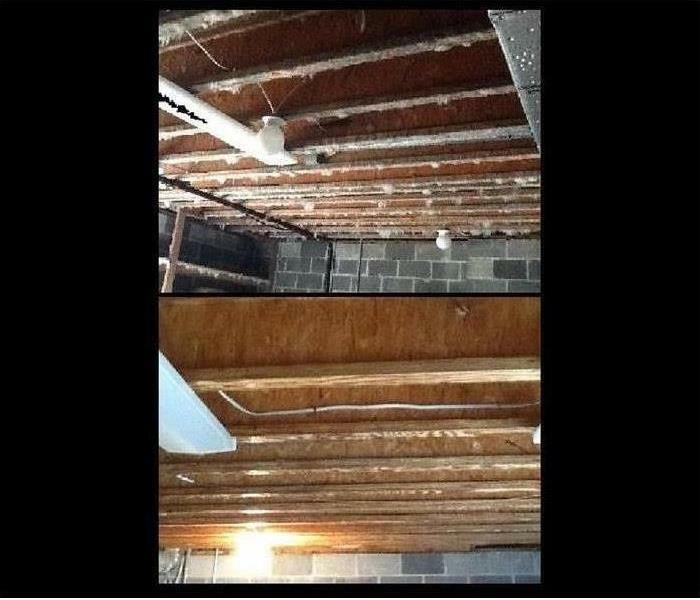 Standing water or condensation and moisture building up within a crawlspace is a pretty good sign that something is wrong with the foundation, circulation of air, lack of adequate insulation, or burst pipe. If it is too damp in this area, the quality of the air in your house can decline, and it may give off a musty odor. A lot of homeowners walk up and down uneven floors for years before they spot a problem. You can test the level of your own with nothing more than a small rubber ball. Unless you know of a reason the foundation is or could be unlevel and not caused by water damage, imbalances should be checked out immediately. They can indicate soil erosion due to water. When the water from rains and storms is draining away from the property in a secure and efficient manner, it never spends enough time close to the building to have a lasting impact. On the other hand, if groundwater is pooling, you may be able to spot slimy and moldy patches on the outer walls of your home. This might sound like a surprising sign, but if your doorframes used to open and close correctly, but have recently started to stick, the problem could be moisture related. It may be a sign that the doorframes have begun to warp, from excessive water absorption. Call SERVPRO of Western Lancaster County for any unwanted water damaging situations that may occur on your property. 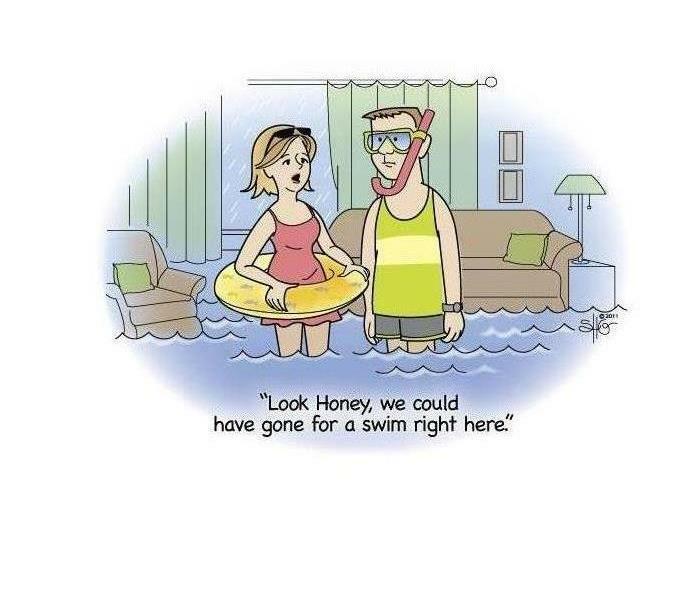 We are experts in water removal, cleanup, and water damage restoration. We will recondition your home "Like it never even happened." This fire was caused by a grease fire. Nobody ever plans for a fire, but when one does happen, SERVPRO is here to help! 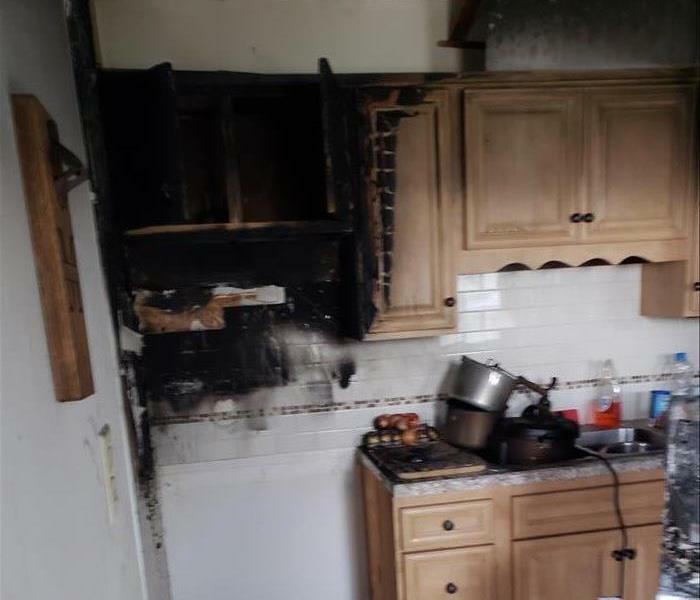 This loss was caused by a grease fire in a kitchen. Now, our natural instinct would be to use water for any fire, but avoid this practice with grease fires! This will just make matters worse. Cover with a metal lid, this will deprive the fire of oxygen it needs to burn. Do not use glass, it will shatter. For small fires, use baking soda. If available, use a kitchen fire extinguisher. If it becomes too much or out of control, get out of the house and call 911 immediately! Safety is of utmost important. For any help with clean-up after, be sure to call SERVPRO! Why YES, it is that time of year again when we will see snow! Snow is very pretty when it is falling from the sky, not so pretty when it is causing trouble in your home. Keep your home protected from winter disasters by taking some extra time to clear the snow and ice off your roof. Not clearing the ice and snow could possible cause ice dams. 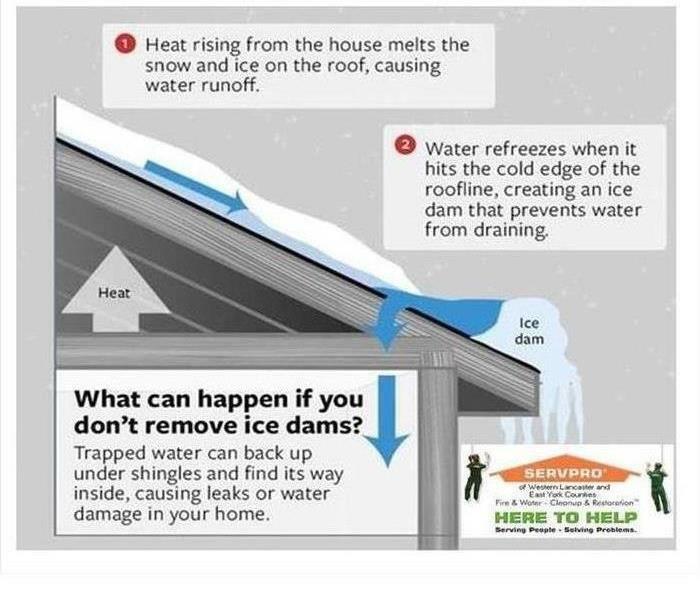 Ice dams are formed when the higher end of the rooftop temperature is above 32 degrees and the edge of the roofline is below 32 degrees. Snow from the heated part of the roof melts and flows down till it reaches the part of the roof below 32 degrees causing the water to freeze and form an ice dam. The water held back from the dam will back up and stay liquid. The trapped liquid will go under shingles finding cracks and flow into the attic; from there it could possible seep through the ceiling and into the interior walls. Sometimes you may have water coming through the ceiling. Sometimes the stagnant water that collects in the attic causes mold growth. The best way to prevent this: clean your gutters when you’re installing your outdoor Christmas lights so that winter’s rain and melting snow can drain. As you’re cleaning the gutters, look for leaks and misaligned pipes and make sure the downspouts carry water at least 10 feet away from the house’s foundation. If you do find mold in your attic, DON’T use bleach! The first step is to call in the experts for an evaluation. At SERVPRO of Western Lancaster County, we’re standing by to answer any questions you might have about attic mold growth or anywhere in your home. There are different types of flooding that a customer needs to be aware of. A flash flood is common in any area and can happen due to inclement weather. A flood can damage a customer’s property but here at SERVPRO of Western Lancaster County our goal is to prevent the damage from happening and restoring the destruction “Like it never even happened." There is flood insurance that a customer can purchase, whether you are renting a home, a business owner or homeowner. A customer can purchase flood insurance through the NFIP. There are communities that offer the NFIP that can reduce a customer’s cost of flood damage. You can also refer to your local insurance agent for questions regarding flood damage. Floods can be devastating to any home or business. Having the peace of mind that can come from flood insurance, will ease the burden, in the event you do have flood damage at your residence or place of business. 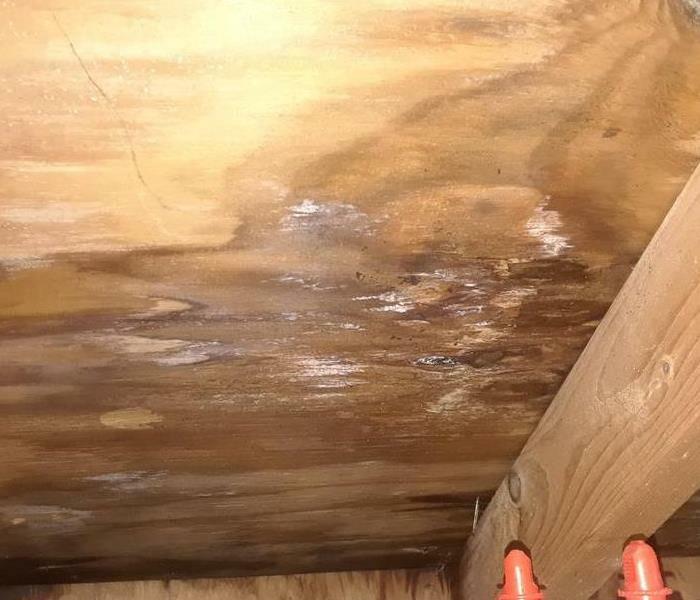 Mold takes root in moist spot on a wooden ceiling. Mold is never good news for anyone. We here at SERVPRO know this, but we are here to help! In Quarryville, we received a call about a workshop with mold growing on the wood of the ceiling (pictured). If left untreated, not only could the repairs cost the owner more than the mitigation, but it also could have significant impacts to their health. The following are a few facts on mold and how to help control it. Mold is a necessary part of our environments ecosystem. Without it, organic matter would not decay and breakdown. However, our homes are not where we want to see mold! Mold needs 3 things to flourish: moisture, an organic food source, & the right temperature. In this case, there was moisture in the wood at the right temperature, leading to the aforementioned growth. Mold only needs 24-48 hours to grow! So, if you notice moisture anywhere it is best to dry it QUICKLY! If there is mold in your home, shed, or anywhere on your property, call us at SERVPRO of Western Lancaster & East York @ (717) 665-1270. We will remove it "Like it never even happened"! Front of home was burnt in fire. SERVPRO removed and rebuilt. 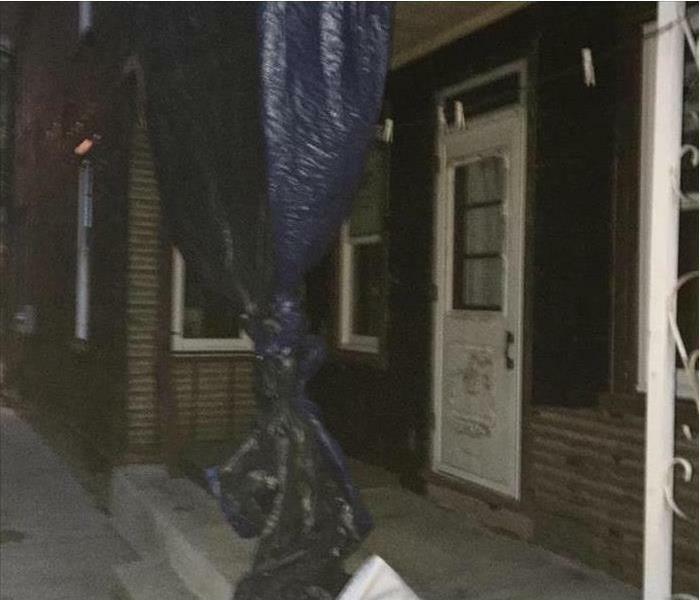 After a few row homes were affected by a house fire, this is one of the homes we rebuilt. Please check out the after picture of the Home's front porch in Before and After Photo Section. SERVPRO responds to emergency during Holiday. What a spill! No problem for SERVPRO! Check out our after photo in Before and After Photos. Fires, floods, and equipment malfunctions don’t care about your annual holiday event, we do. When an equipment malfunction caused an oil slick in the kitchen of a church in York, they called in the professionals at SERVPRO of East York and Western Lancaster Counties to get them up and running in time for their traditional Lent Friday Fish Fry. 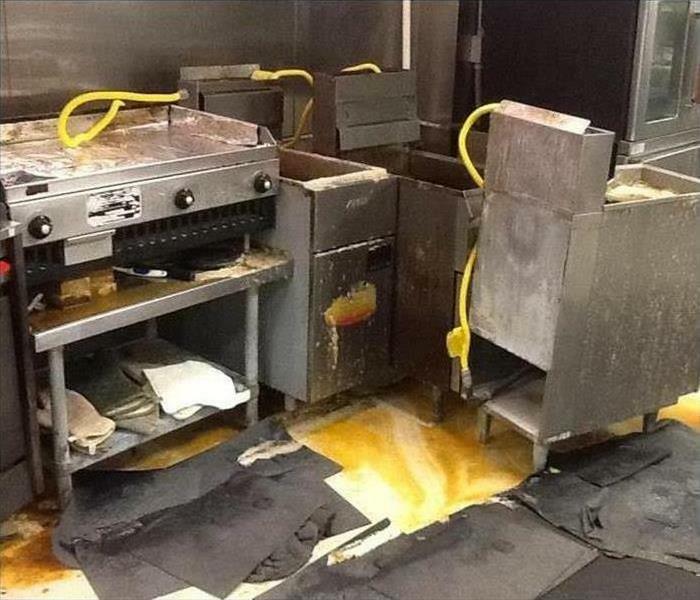 Shortly after receiving the call, our crew was on site extracting the fryer oil and steam cleaning their equipment to minimize their downtime. Within 5 hours of getting the call, our crew completed the extraction and cleaning process so the kitchen staff and volunteers at the church could return to preparing for their annual event like the oil spill never even happened. It is an awesome feeling helping out our community! Emergency Ready Profile valuable to this local nursing home! Designated parking for SERVPRO by the nursing home's SERVPRO ERP. 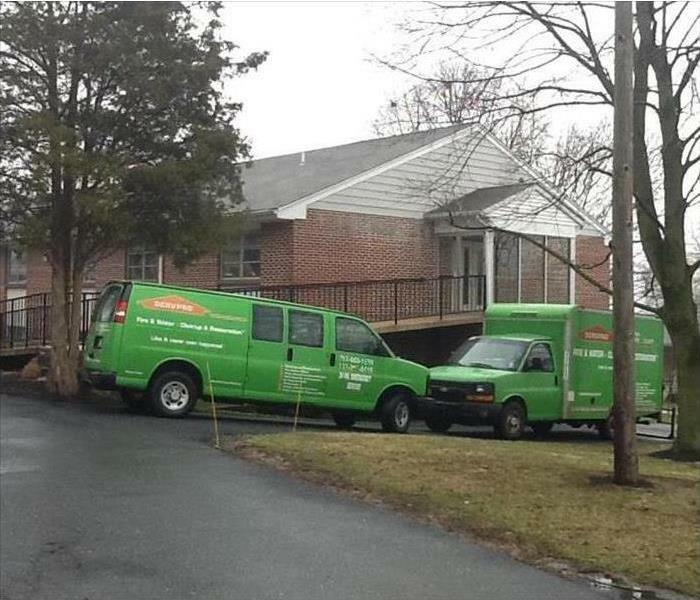 Approximately, 2 years ago SERVPRO prepared a local nursing home with an Emergency Ready Profile, ERP. The ERP is great for the administrators of a facility to keep track of regular maintenance vendors, utility vendors, police departments, etc. It also has an android or iPhone app for easy usage. This program also tells SERVPRO where emergency vehicles are required to park when needed. This year, we were called to a water emergency at the homes. Nursing home administrator alerted us and we followed their ERP parking protocol. Everyone was safe and secured during the entire process. This is a great example of an ERP in use and why your company should have one as well! 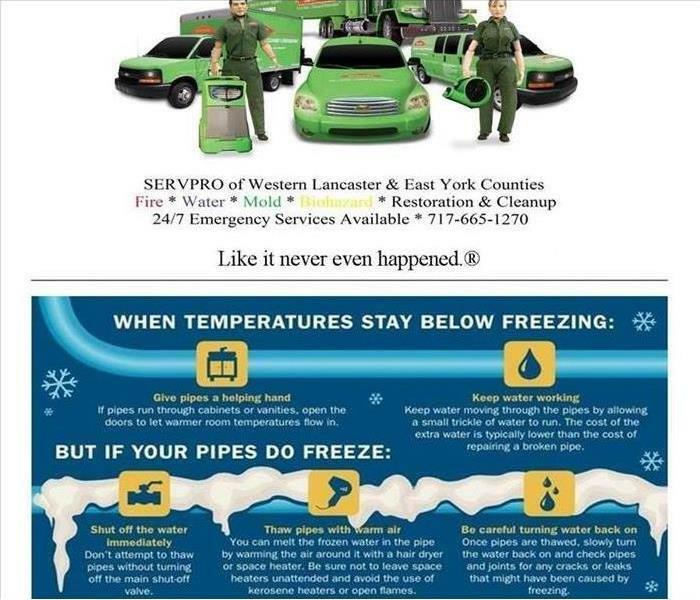 Call SERVPRO of Western Lancaster County for a free ERP! 6/20/2018 - SERVPRO responds to emergency during Holiday. 6/20/2018 - Emergency Ready Profile valuable to this local nursing home!